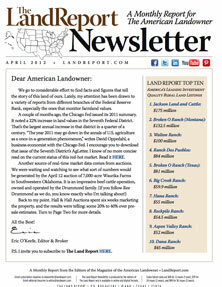 Our April newsletter features more reports from the Federal Reserve on rising ag land values. The Seventh District, which is based out of Chicago and is home to a wide swath of the Midwest, saw a 22% increase in land values last year. This spike corroborates activity seen in other ag-related markets, such as Hall & Hall’s successful auction of Oklahoma’s Waurika Farms for $11 million on April 12. 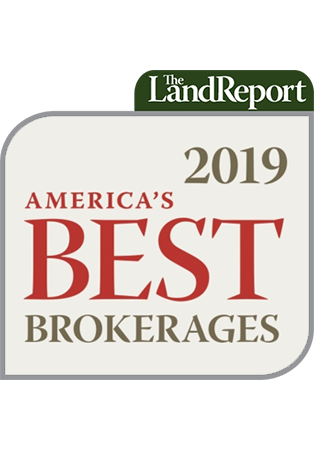 For more up to the minute reports on listings, auctions, sales, and breaking news pertaining to land and landowners, be sure to follow The Magazine of the American Landowner on Facebook and Twitter. The Land Report is also on Pinterest.